But if you go back to the concept of the oxidation state, it might make some more sense. If you just pay attention to what’s happening to the oxidation state of the carbons, you can follow along to see if it’s an oxidation or reduction. 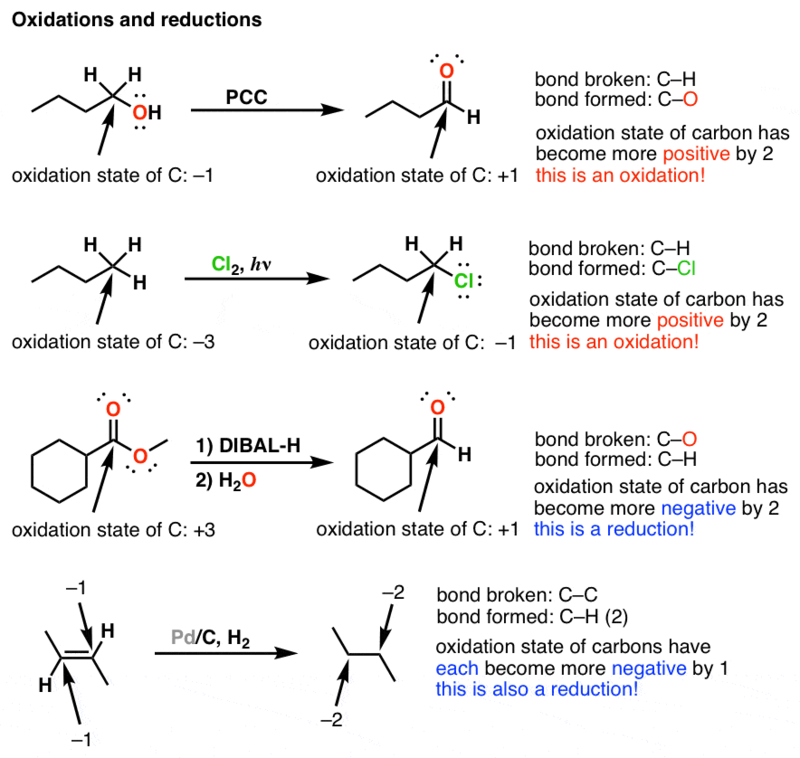 If the oxidation state is becoming more negative, it’s a reduction (gaining electrons). If the oxidation state is becoming more positive, it’s an oxidation (losing electrons). All of these events affect the oxidation state of the carbon, and this ties back to the concept of oxidation that I originally learned in high school: keeping track of the gaining (and losing) of electrons. When I finally understood this I was happy to note that the term “oxidation” finally made sense again. “Reduction” still didn’t, but I learned to live with it and moved on. You will too. In gen chem (at least in the US), we sometimes learn the mnemonic OILRIG for redox reactions: Oxidation Is Loss (of electrons), Reduction Is Gain (of electrons). In organic chemistry, we rarely calculate out the actual oxidation state of carbon. We more often use the mnemonic you have above: Oxidation is loss of C-H bond or gain of C-X bonds, and Reduction is the gain of C-H bonds or loss of C-X bonds. The next oxidation level up would be alkynes, aldehydes, or ketones, and organic chemists would typically consider these at ‘the same oxidation level.’ Next is esters, amides, acids, acid chlorides. 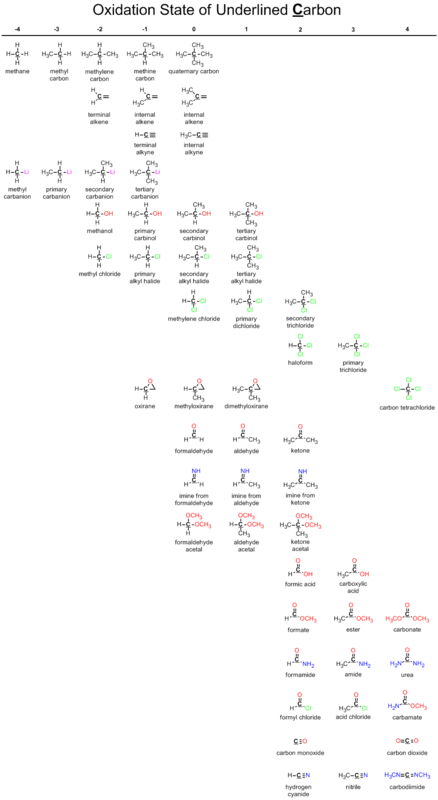 Finally, carbonates, carbamates, and carbon dioxide are all at the ‘most oxidized oxidation level. 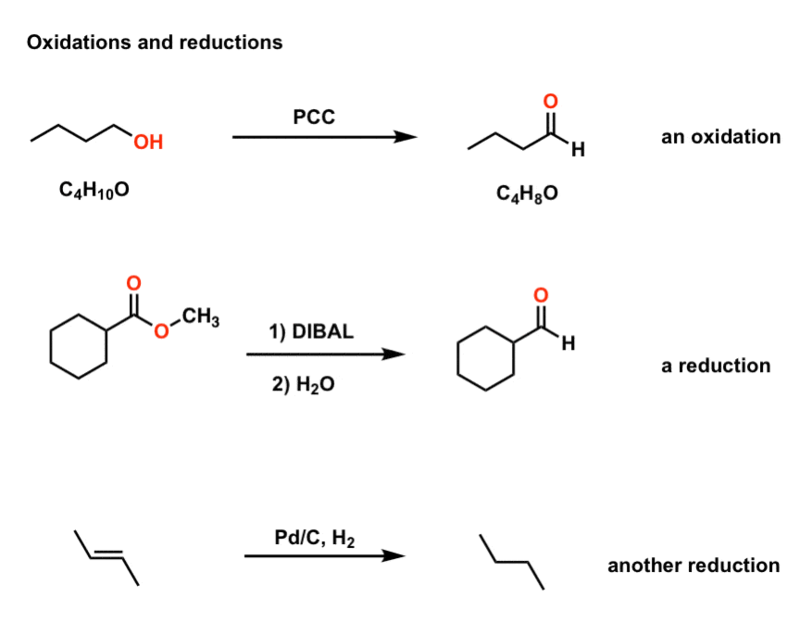 If I oxidize a primary alcohol with PCC, the molecule is oxidized one oxidation level to an aldehyde. 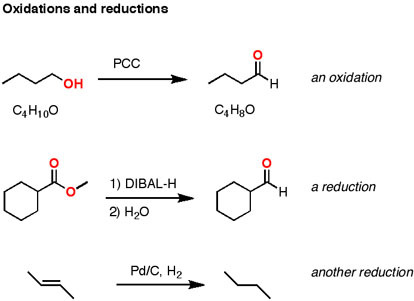 If I oxidize a secondary alcohol with PCC, the molecule is oxidized one oxidation level to a ketone, thus ketones and aldehydes are ‘at the same oxidation level,’ right? This chart somewhat illustrates my point. Everything within a vertical column an organic chemist would consider ‘at the same oxidation level.’ To move to a different column, one needs to perform an oxidation or a reduction reaction. 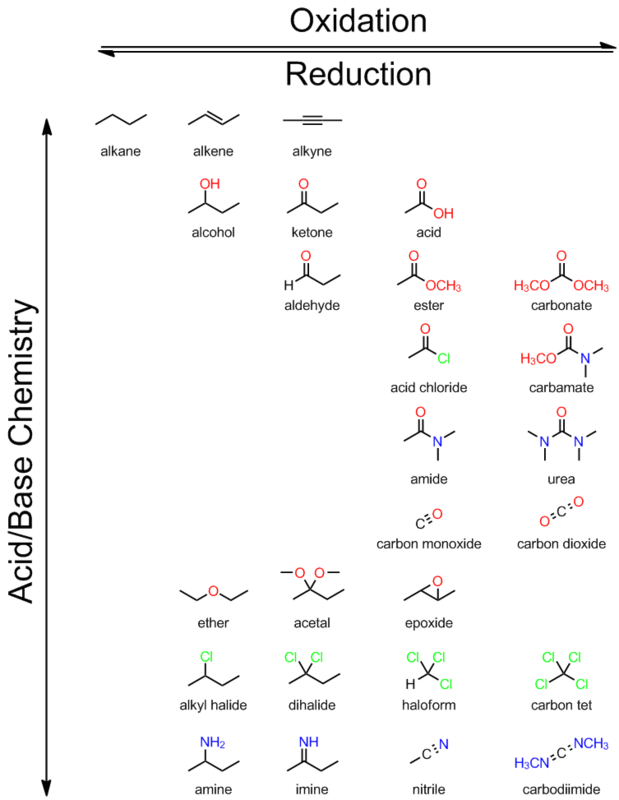 To move within a column (from an aldehyde to an acetal), one only needs to use acid/base chemistry (thus, chemists also learn that acid/base reactions are not considered redox reactions). Yet, when you actually go through and calculate the oxidation state of carbon in each case… an aldehdye and a ketone are definitely not at the same carbon oxidation state… and can never be! I think this speaks to the ‘formalism’ aspect of oxidation states. It’s a bookkeeping tool (and a useful one), but depending on how you use it, it can be confusing. I’ve discussed this in two other places, and I never seem to find the right words. Basically, one must be careful how one defines ‘oxidation state,’ because organic chemistry and organic chemistry define it differently. Thanks for such a detailed response. I find it hard to find the right words too. As an organic chemist, I consider aldehydes and ketones to be at the same “oxidation state” but like you said the oxidation number at carbon is different. It’s a mess, but I’m not sure what can be done about it. Thanks for exposing me to the historic perspective that I was unaware of. I love it, but always worry if that approach isn’t too academic. For (too) many people, history began the day they were born. This explanation (and whole site really) is awesome! Wish I’d stumbled across this site months ago. I remember learning that “reduction” meant “reducing the overall charge on the atom”. Meaning when you gain an electron, the atom is going to be more negative and its charge is going to be reduced! That helped me make sense of the word reduction. Thanks for a great explanation! But what does “CONTROLLED OXIDATION” mean then? I have heard of oxidation as loss of electrons, gain of oxygen, and as loss of hydrogen. I have also heard of reduction as gain of electrons, loss of oxygen, and as gain of hydrogen. In other words Fe + H2O = H2 + FeOx(with the x standing for unknown amount of O) where the water is reduced to hydrogen and the iron is oxidized to one or more of lots of different iron oxides. 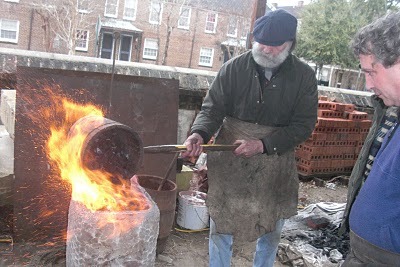 In the meantime I understood what oxidation is all about, and I understood what acidity is all about. What I didn’t understand yet is how the two interact. I know that there are RedOx reactions that are favored by acidity, but can you say that “oxidation is favored by acidity” (probably not?!)? Is it true that iron oxidizes faster under acidic conditions? Does it therefore oxidize more slowly under basic conditions? The reduction half reaction is clearly dependent on pH – it involves the formation of hydroxide ion. Given this information, what pH (in general) do you think would favor the formation of rust? Hi James – In your last four structures, how did you calculate the magnitude of the oxidation states for the carbon atoms? What are the rules or formula you used to determine this? Thanks. Hi Chris – the oxidation state for carbon goes as follows. Start with a value of 0 for the carbon. Each bond to an element of higher electronegativity than C counts as –1. So this would be for O, Cl, F, N, Br, etc. Each bond to another carbon counts as 0. Each bond to an element of lower electronegativity than C counts as +1. This includes atoms such as H, B, and almost all metals. Two quick examples. So CH3Cl would be: start with zero, subtract add 1 for Cl, add subtract 3 for the three hydrogens—> -2. I could be having a senior moment, but I think that you mistakenly gave the wrong values. H should count as a -, while electronegative atoms should count as a + (as we are stating this from the view of carbon, correct?). Shouldn’t CH3Cl be -2 and acetylene be -1? Thank you so much. These concepts have never made sense to me and learning ochem had made it harder. This is awesome. I understand now what’s happening instead of just memorizing. Thank you. I am so glad you found it useful Sarah. Understanding versus memorizing is the goal!! !